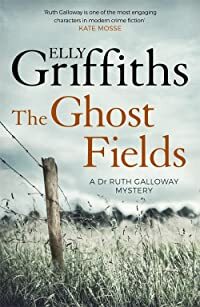 The Ghost Fields by Elly Griffiths is one of her Dr Ruth Galloway mysteries and it was published in 2015. The setting is Norfolk where Ruth has been called in to help when a body is discovered in a World War 2 aeroplane which has been dug up by a man in a digger who is clearing a field prior to houses being built on it. The whole area had been peppered with US airfields during the war, Norfolk was the ideal location due to the extreme flatness of the county. Of course nothing is straightforward and so begins a mystery involving a local landowning family. This is an enjoyable read, it was good to catch up with everyone again and a bit of a shock to realise that Ruth’s daughter Kate is at the stage of starting school already, but such is life as you’ll know if you’ve been down that road yourself. The love lives of everyone involved in these books have just become even more of a mess. There’s nobody in a truly happy relationship although it looks like Cloughie might be on the right road, although I’m not holding my breath. I’m looking forward to reading the next one in the series which I think is called The Woman in Blue. One mild annoyance is that aeroplane hangar is spelled hanger – silly. 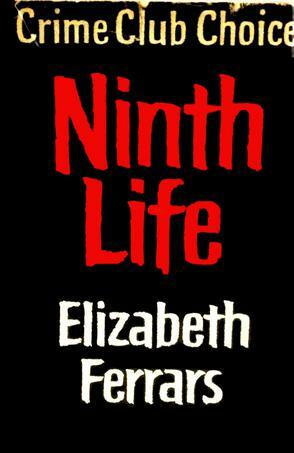 Ninth Life by the Scottish author Elizabeth Ferrars – or E.X. Ferrars as she seems to have been known in the US – was first published in 1965. I enjoyed this one which was more of a mystery than murder mystery – for 85%-ish of it anyway. Caroline lives in London on her own and works in an office, she’s always beeen independent but when she needs to recuperate after having her appendix removed she agrees to go to Fenella her much younger married sister’s house until she’s well enough to look after herself again. They have a rather fraught relationship as Fenella feels that her older sister is too domineering and she has kept Harry her husband away from Caroline so this is the first time the two will be meeting. Harry isn’t at all Fenella’s usual sort, he’s older than she is, not particularly good looking and has given up journalism, supposedly to concentrate on writing a book. Meanwhile he and Fenella have opened their lovely old home as a guest house. But Fenella knows that Harry has more money than he should have. Where is the extra money coming from? The blurb says: The brooding atmosphere explodes into violence and death. Miss Ferrars achieves a high suspense, not by fireworks or blood-baths, but by the precise observation of character and mood, and by her skill in surprising the reader at the climax. 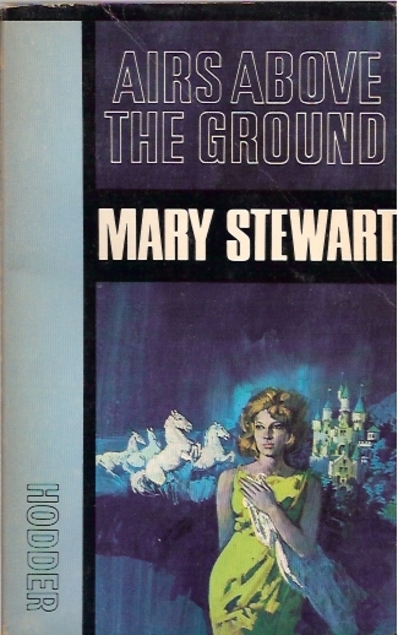 Airs Above the Ground was first published in 1965 but my paperback copy is from 1967, I really like the cover and I found the book to be a great read. In fact I’m sure that if this book had been written by a man it would have had a much higher profile and might have been made into a film. A lot of it is full of suspense, it’s much more of an adventure/mystery than for instance – John Buchan’s books, in my opinion. On page one the Guardian newspaper is mentioned as the main character Vanessa March is a Guardian reader. Presumably Mary Stewart was also one as she incorporated a classic Guardian misprint in an article from the newspaper. The word ‘churned’ appears when it should have been ‘burned’. In case you don’t know, the Guardian is affectionately called the Grauniad as the typesetters were always making mistakes. Of course nowadays it’s all done on computers so that isn’t such a problem – or feature. Anyway, back to the book. Chapter one begins in Harrod’s tearoom where Vanessa March is having tea with her mother’s old friend Carmel. Vanessa has only been married for a few years and she’s had a bit of a ‘domestic’ with her husband Lewis as he has had to change their holiday plans at short notice. From something that Carmel says – it seems that Lewis might not be where he says he is and so follows the adventure with Vanessa travelling to Austria in search of the truth and Lewis, with help from Tim – Carmel’s seventeen year old son who is in need of time away from his suffocating mother. Tim’s a huge fan of the Spanish Riding School in Vienna and the Lipizzaner horses, and he’s very impressed that Vanessa is in fact a trained vet. With the storyline moving on to a travelling circus featuring animals (a pet hate of mine) it was a bit of a wonder that I wasn’t put off by that, although circus acts don’t feature too much. I read this one for the Read Scotland 2017 Challenge. Sadly I don’t have too many of Mary Stewart’s books still to read now, I think I’ve read them all except My Brother Michael and maybe Madam Will You Talk. As Chimney Sweepers Come to Dust by Alan Bradley was published in 2015, it’s the seventh book in the Flavia de Luce series which I have really been enjoying catching up with over the past couple of years. Having said that – I didn’t love this one as much as the others, mainly because the setting is Canada where Flavia has been sent to attend her mother’s old boarding school. It’s a weird place with strange rules, run more along convent lines really as the rules don’t encourage friendships and worst of all there’s no privacy in the place with people just walking into other people’s rooms without so much as a by your leave. It’s not long before Flavia finds herself on familiar ground though as a partially mummified body comes thudding down her bedroom chimney, also three of the girls have gone missing over the last few years. Obviously there’s investigative work for Flavia to get stuck into. This one missed out on all the family banter and ructions because of the setting, which adds quite a bit of background atmosphere to the books usually. Away from Flavia’s home life, her sisters, father and of course her best friend and mentor Dogger, Flavia realised that she even missed her ghastly sisters, and so did I. The teachers and pupils of Miss Bodycote’s Female Academy didn’t make up for their absence. It was still a good read though. To Love and be Wise by Josephine Tey was first published in 1950 and she must have been feeling comfortable financially because she gifted the copyright to the National Trust. In fact when she died in 1952 she left everything to the NT. I’ve been on something of a mystery binge recently and I think this is the one which I have enjoyed most. Salcott St Mary is an old village which had been a quiet backwater until the actress Marta Hallard decided to settle there, she bought the ‘big house’ and that put the place on the map, meaning that a lot of other show business types followed in her footsteps. Detective Inspector Grant happens to be a good friend of Marta’s and it’s whilst attending one of her parties in London that he meets Leslie Searle, a young American who turns out to be a well known celebrity photographer to the stars of Hollywood. I think it’s better than The Franchise affair, which is usually thought of as being her most successful book. Josephine Tey was of course a Scottish author so this one counts towards the Read Scotland 2014 challenge. 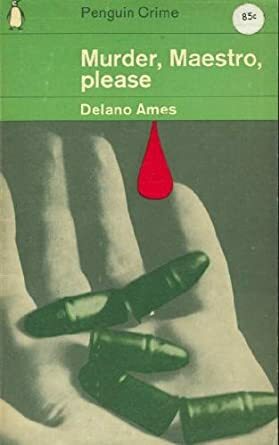 This is just the second book by Delano Ames which I’ve read and I have to say that it puzzles me that he isn’t better known. His writing is really enjoyable, witty and also unusual in that although his detectives are a husband and wife team, Jane and Dagobert Brown, it’s Jane who is narrating and Ames manages to get the authentic sound of a long suffering wife perfectly. The Browns are staying at a pension in the south of France and have made several acquaintances in and around the town. There has been political upheaval in Santa Rica and Don Diego Sebastiano, a Santa Rican diplomat is in fear of his life. When a shot is fired into a crowded street Don Diego assumes that he was the target, but was he and who is the culprit? I really like the characters of Jane and Dagobert who are a funny and believable couple. The mystery isn’t bad either. This is the first book by the French author Fred Vargas which I have read, in fact I had never even heard of her (yes Fred is female) until Joan Kyler mentioned she was reading a Vargas book. This one was first published in 2006. Sophia Simeonidis is an opera singer, living in a good neighbourhood in Paris with her husband Pierre. The only blot on their landscape is the house next door which is uninhabited and has been left to go to wrack and ruin by its owner. The house is known locally as ‘the disgrace’. Sophia is unnerved by a mysterious tree which has appeared overnight in her garden. Who planted it and why? Pierre is completely unperturbed by it but Sophia is worried that something has been buried underneath it and it weighs on her mind. Marc, Mathias and Lucien, are all around about 35 years old and originally met each other at university. None of their ambitions has been realised and so they are fairly down at heel. When Marc walks past the shabby house which is situated next door to Sophia’s house he decides to try to rent it, it should be financially manageable with the help of his two old friends, and he would be able to move his uncle/godfather in too. Vandoosler, his uncle is an ex-policeman and he is the one who names the three younger men ‘the evangelists’. The younger men are quite eccentric characters, but also very likeable. After the evangelists move in next door, Sophia asks them to dig under the tree, to put her mind at rest. Not long after that Sophia goes missing, but Pierre claims there is nothing mysterious about it and he isn’t worried at all, but Sophia’s friends are worried. Although this is a fairly recent publication, for me it had the feel of an old fashioned mystery, and I mean that as a compliment. Modern crime fiction is often too gory and violent for my liking, so I’ll definitely be reading more by Vargas in the future. Obviously this book was originally written in French and was translated by Sian Reynolds, who deserves praise for producing a very smooth and readable translation. This is the only book by Freeman Wills Crofts which is on Project Gutenberg. Of course it’s one of his first crime novels, dating from 1922, his books were published from 1920 until his death in 1957. I think he did improve over the years. Seymour Merriman is in the wine trade and part of his job entails travelling around France and visiting vineyards. On one of his travels his motorbike runs out of petrol in a rural district, stranding him in what he thinks is the middle of nowhere, but he discovers a tree felling business nearby and walks there, in the hope that they will be able to sell him some petrol. On the road down to the offices Merriman meets a young woman and she arranges for him to get some petrol but Merriman’s suspicions are raised by the strange movements of one of the lorries which was being used at the tree felling business. He’s determined to find out what’s really going on. Around about half way through this book I started to get the feeling that it was beginning to drag but almost as soon as I thought that the whole thing was enlivened by the appearance of Inspector Willis of Scotland Yard. My one gripe is the romantic element, I’m really happier to have my vintage crime sans romance, but a lot of people must see it as a plus, publishers included. Just think of all the episodes of Morse which involve Morse and love interest, I could just do without it. Maybe it’s my age! No – scrub that – it’s just that I’m not much into romantic fiction, unless it comes with a big dose of humour. As I said though, The Pit Prop Syndicate was Wills Crofts’s first foray into fiction and it’ll be interesting to see how his writing improves over the years, and of course, as I downloaded this onto my Kindle for free, everything’s hunky dory, especially as I don’t have to find shelf space for another book. If you’re interested you can download it here. Manna From Hades is the first book by Carola Dunn which I’ve read, but it won’t be the last. Although it was first published in 2009, the book is set in Cornwall of the late 1960s or 70s, as the author spent a lot of her time there when she was growing up. She has definitely captured that atmosphere. Eleanor Trewynn has spent a lot of her life living abroad as she and her husband spent their working lives helping those less fortunate in far flung countries. Now that she is retired and she is a widow she is living in a small Cornish village, having just had enough money to buy a small house, the ground floor of which she has turned into a charity shop, while upstairs she has her home. Whilst gathering donations for the shop Eleanor discovers a small case full of jewellery amongst the clothing but has no idea who donated it, and so begins a mystery! I’m not going to say any more about the storyline as I don’t want to spoil it for people! This is an entertaining sort of easy reading book which harks back to the time when female detectives were a rare thing and women weren’t allowed to wear trousers to work. Something which I’m sure people can hardly believe nowadays but until the equality of the sexes laws came about in the mid 1970s that is what life was like for women. It says on the front cover A Cornish Mystery and that was one of the reasons I chose this book because if a book is set in Cornwall then it’s a plus for me. I just realised recently that the Malory Towers series by Enid Blyton is set in Cornwall and I loved those books so they probably kick started my love for Cornwall, long before I ever managed to visit the place – and I wasn’t disappointed when I eventually got there. Anyway, I’m keen to read more of Carola Dunn’s books, even if they don’t have a Cornish setting. Although Dunn was born and raised in England she now lives in the US – Oregon I believe. My thanks to Jo at The Book Jotter who encouraged me to start reading Dunn’s books, although Jo hasn’t read this one yet.